While I might agree with the author of this reply, his view is not accepted by Chareidi MKs, who are insisting that the current law remain in effect which forces one to decide between the mandatory IDF draft or learning in yeshiva -- so that people "stay in yeshiva." Based on feedback from readers, "Nachal chareidi is accepted as a good thing by most mainstream chareidim. But it’s like anything else, it’s good but “not for my son” since it’s an admission of failure in the Torah world, which is true." Yoseph Goldsmith's article in itself does not warrant any replay, as the "facts" presented there are far from true. Yet, I chose to write and present Ynet's readers with the facts and the Haredi Nahal. This is not the place to discuss the haredi worldview that requires everyone who's willing and able to dedicate their life to the study of the Torah as a part of the multi-generational Jewish effort to preserve the Torah and the Nation of Israel. The reluctance of many haredim to enlist is therefore a function of their fear that military service will damage their ability to serve the nation the Torah's way. Nevertheless, those who do not wish or do not want to join this idealistic group, are morally obligated to enlist and fulfill their duty like any other Israeli youngster. In the past, the conscientious ones who did not study in yeshiva, avoided army service – and justly so. The spiritual risk military service in a secular environment (including the presence of female soldiers and the sub-standard kashrut in the IDF bases) posed was too great. Yet, after the IDF and a group of rabbis launched the "Netzah Yehuda" Brigade in which the highest religious standards are maintained, every observant man who feels morally obligated to enlist, can do so without the slightest fear of social pressure or temptation. The 2,000 haredi soldiers and their families are living proof. Goldsmith wrote that he knows many youngsters who lost their spiritual way in the army. I say, these young men lost their way long before they enlisted. Therefore, any haredi who does not study Torah and does not enlist is guilty of Chillul Hashem (Hebrew: "Desecration of the God's Name"). Rabbi David Fuchs has been following the Haredi Nahal project since its establishment eight years ago. I moved to Israel 23 years ago and within a month of arriving, we had already signed a contract to build our home in Karnei Shomron. We took out a mortgage which we are still paying and committed nearly all our savings to the home. We moved in more than 20 years ago, with three children. Two more were born after we already lived in Samaria. Our children are mostly out of the house now, at least during the week, but they come home for Shabbat, to the home and community that they have always known. On Shabbat, we go to synagogue and visit with friends, catching up with what is happening to everyone in the community. As I watched Bush, Olmert and Abbas on television I looked to the walls next to our television and saw the bookshelves, where our books are overflowing on the shelves. Years of accumulation. I looked at the pictures on the wall, most of which have been painted by my very talented daughter. Years of activity. And I looked straight at Bush, Olmert and Abbas and asked them: What is it about my house, my family, my community that is an obstacle to peace? What is it about our lives that prevents the Arabs in the neighboring villages from enjoying peace and security, from living their own lives. If my son gets married and wants to live nearby, should he be asking Abbas and Bush for permission to build a new house? We live in Judea and Samaria and we love it here. We have taken rocky, barren land and turned it into a paradise. We have planted trees and gardens, built schools and shops and raised our children to love the land as we do. The world has gathered at Annapolis, in part to solve the Palestinian refugee problem. But, in so doing, they have put forward a plan that will create an enormous Jewish refugee problem. I am not willing to be a refugee. I tremble at the thought of going through what my friends from Gush Katif went through. I came to Israel to set down roots in my own homeland, roots that cannot be set down by a Jew anywhere else in the world. I set down my roots in Samaria. I built my home on land that did not belong to any Arab, that had not been cultivated by anyone for centuries, on the same spot where Jews lived thousands of years ago. How dare anyone try and take that away from me? Sondra Oster Baras was born and raised in Cleveland, Ohio in an Orthodox Jewish home. She was educated at the Hebrew Academy of Cleveland, a religious all-day school sponsored by the Cleveland Jewish community. Upon graduation from high school, Sondra studied religious studies at the Jerusalem College for Women in Israel. She completed her B.A. in history and English at Barnard College in New York. She obtained her J.D. at Columbia University's School of Law. In 1984, after practicing law in New York for a short time, Sondra moved to Israel. Sondra continued her legal career in Israel, after being accepted to the Israeli bar. 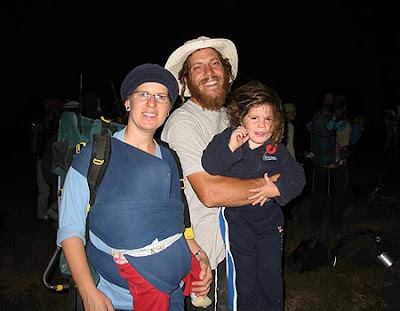 Sondra Oster Baras currently resides in Karnei Shomron, together with her husband Edward, a computer programmer, and their five children. When I was younger, it annoyed me to no end that the US Reform movement fanned the flames of the "Who is a Jew" patralineal descent and reform conversion controversy in Israel. Who were these Americans to influence internal Israeli policy? Do they vote, pay taxes, fight in the IDF, learn day and night for the protection of the country, or participate in any manner with Israel's destiny? It was easy for me at the time to dismiss their view; Judaism has always been based on matralineal descent. Breaking that paradigm removes the last common denominator of Jewish unity. Additionally, Reform Judaism in Israel is grown by the Reform movement in the US, not the other way around -- and is still a tiny minority in Israel. Secular Israelis are not Reform, and as many of my secular Israeli friends say, "the shul they don't daven at is a dati, Orthodox one." Prime Minister Olmert Ehud stated yesterday at Annapolis, that the Israeli government alone is the only party that has the right to determine the fate of Jerusalem -- a direct snub at American Jewish groups who stated that Jerusalem is a "Jewish" issue and not an "Israeli" one. Should Ehud Olmert alone should not have the right to determine Jerusalem's fate? Olmert takes world Jewry's money, takes their support, asks for their support, begs them to visit, asks them to plant trees...yet he alone is allowed to determine the fate of Jerusalem? Perhaps the time has to come where the State of Israel humbly acknowledges that they alone cannot decide the fate of Jerusalem? One interesting idea I heard from Moshe Feiglin is that if he were Prime Minister of Israel, we would favor a 2 house parliament, where 1 house would be comprised of the residents of Israel (Jews, Muslims, Christians, all residents of the land), which would deal with internal issue of local importance. The second house would be for Jews only -- to deal with issues of national, Jewish importance. After all, as Israel is a Jewish State and national Jewish homeland, this house of parliament should have representation of World Jewry. When I looked at this website yesterday (what can you do to help save Jerusalem) that opposed Olmert's policy of splitting Jerusalem at Annapolis, I found the following Jewish groups to be aligned with the website -- for Olmert to snub them means he just wants your money, but doesn't really care about you at all. (The OU should take heed before they honor Olmert again). Another related topic from yesterday is an "alternative" Jewish Congress that met yesterday. THE NEW JEWISH CONGRESS, a Preparatory Conference Concerning THE SOVEREIGNTY OF THE JEWISH NATION OVER THE JEWISH STATE IN ERETZ-ISRAEL, is currently (TUESDAY, November 27, 2007, 3:30 PM underway in Ramada-Renaissance Hotel in Jerusalem. The conference will close its doors at 8 PM this evening. The conference evoked considerable interest among Israelis from all walks of life, some of whom found themselves rallying in Jerusalem until late last night against Annapolis and then returning to the city to attend the conference which opened its doors this morning. Jews and Gentiles abroad also expressed interest and support. Political issues of Jewish sovereignty were discussed by Shlomo Idan, a secular intellectual and Mattot Arim activist residing in Rehovot, an academic town which houses the world-famous Weizmann Institute of Science. Idan discussed the Hebrew concept of "gnevat kolot" (vote stealing) in which a politician elected under a first agenda turns around and operates under a contradictory agenda. Idan noted that this phenomenon when practiced by two reneging rightwing MKs in 1995 had resulted in the Oslo accords passing by a majority of exactly 2. Another example was the forceable deportation from Gush Katif initiated by Premier Ariel Sharon who had been elected on precisely the opposite agenda as evidenced by one of his well known pronouncements promising permanent status to settlements. A third example was the vote of the 300,000-strong Likud membership against the Gush Katif deportation, initiated by Premier Sharon himself but ignored when the result was the opposite of that he anticipated. Finally, Idan focussed on a quote by veteran Israeli MK Micky Eitan in which Eitan asserted that a party platform does not obligate the representatives of that party. Idan warned that a solution, perhaps even legislation, must be found to eradicate this phenomenon which renders the Jewish people powerless to control its own destiny as unscrupulous politicians take the helm again and again. Aviad Vissoly, Likud activist and attorney hailing from Haifa, spoke about the contentious issue of the eastern border of the Jewish state. Vissoly pointed out that the eastern border of Israel clearly includes the entirety of Judea and Samaria since Israel has applied its sovereignty to this area on at least six separate occasions, namely in its Declaration of Independence (de jure), in the Six Day War (de facto), when Jordan announced its disassociation from Judea and Samaria, in Israel's peace accord with Jordan, brokered by the United States, in which the international border with Israel's eastern neighbor was determined to be the Jordan River, in the Oslo Accords in which the Palestinians agreed to autonomy, as opposed to a state, and that in specific regions termed A and B alone rather than in the entirety of Judea and Samaria, and by virtue of the application of many Israeli laws to Judea and Samaria. Rabbi Dov Stein, a central rabbinical activist in an attempt, spearheaded by talmudic scholar Rabbi Adin Steinzaltz, to revive the Sanhedrin, described the civil service and warned of the dangers of nepotism in the ranks of the civil servants of the Jewish state. Blatant favoritism toward relatives and friends is not conducive to the Jewish sovereignty that is to be striven for, Stein said. Dr. Amnon Hever spoke of social justice in the spirit of Israel's prophets, such as Isaiah, Amos and others, and emphasized that this was a prerequisite for rebuilding of the Temple according to various Jewish sources. 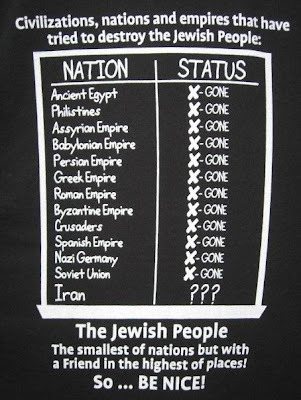 Hever regretted that Israel's early pioneers, who were committed to social justice, attempted to implement it relying on the principles of communism and socialism as opposed to sterling Jewish principles. Hever suggested that alternative frameworks take upon themselves various social, economic and health functions which Israel's government is failing to provide. Hever's analysis shed new light on the proliferation of just this type of organization in Israel today, effectively replacing the government in many arenas, such as mutual aid philanthropy (thousands of Gamach funds often run by synagogogues or respected individuals, Koach laTet and more), health (Ezer MiZion, Yad Sara, Rabbi Firer's consultation service, Kav laChayim, etc.) emergency care (Hatzala, Zaka), financial consulting (Paamonim), labor relations (Maaglei Zedek), criminal justice (Human Rights in Yesha, Honenu) and more. Tel-Aviv philosopher Ohad Kamin spoke on the topic of human rights and emphasized that this modern notion is based directly and almost exclusively on classic Jewish values. Kamin said that this should be emphasized, to give the Jewish state a better standing in international politics in which human rights is a very popular and politically inspiring concept at this time, particularly insofar as young voters and activists are concerned. Focusing on this topic would allow Israel to win its existential wars and simultaneously to exercise its traditional role of acting as a "light unto the nations", Kamin said. It's becoming more and more obvious that Olmert, and even the State of Israel should not be able to unilaterally decide the crucial issues of Israel's existence -- especially when asking for everything from World Jewry. And regarding Reform Jewry's patralineal descent and conversions...that's going to be a very difficult issue to reconcile. In an unprecedented move, Google Inc. (Nasdaq:GOOG) has agreed to supply the IP address of an Israeli blogger who used "Google Blogger" for a blog in which he slandered Shaarei Tikva council members running for reelection. The election is being held today. So far as is known, this is the first time that Google forewent legal action in such a case. The slandered Shaarei Tikva council members asked Google for the blogger's name. They reached a settlement with the company on the basis of an Israeli ruling on the subject. The settlement stipulates that 72 hours before a hearing on the case at the Rishon LeZion Magistrates Court, the council members would leave the blogger a message on his blog summoning him to the hearing, or else his IP address would be handed over. The notice would invite the blogger to disclose his identity, participate in the hearing, or oppose the disclosure of his identity by filing a motion as "anonymous". For more than a year, the anonymous blogger slandered three Shaarei Tikva councilmen: local council chairman Gideon Idan, Shaarei Tikva director general Haim Blumenfeld and council member Avi Yokobovich. The blogger accused the men of criminal acts, such as pretending to be handicapped in order to receive discounts on local property taxes, receiving bribes from a contractor, and having ties to criminal gangs. The three councilmen filed a NIS 300,000 lawsuit against the blogger, who was named "anonymous" in the statement of claim. They also asked for a court order ordering Google to disclose the blogger's IP address, which would enable the court to contact the blogger's Internet services provider and order it to disclose the blogger's identity. Google initially said that disclosing the blogger's identity violated rulings on the balance between freedom of expression and a person's right to his reputation. However, in a pre-ruling, Judge Oren Schwartz said that the blog's content raised suspicions of criminal conduct, and Google took the hint. Judge Schwartz applied the strict position of Tel Aviv District Court Judge Michal Agmon that the details of a surfer may be disclosed only if the slander was tantamount to criminal defamation. Following Judge Schwartz's ruling, Google and the councilmen reached a settlement in their dispute. Google was represented by Adv. Keren Beer and Adv. Hagit Blaiberg of Goldfarb, Levy, Eran, Meiri & Co. /a> and the councilmen were represented by Adv. Ben Zion Adoram and Tomer Altus of Adoram & Co. The court's decision (in Hebrew) is here. Sources in Hebrew here, here, and here. A sad day for Israel's bloggers indeed. If you’ve driven from Malcha to Gilo, you know how ridiculous and impossible the idea of dividing Jerusalem really is. You drive through the main road that divides the town of Beit Safafa in two. I am sure I can’t even count on one hand the number of residents of Beit Safafa that want to be cut off from Jerusalem, from the Israeli government subsidies, from their jobs, and from their lives - to join the PA.
And what are they going to do? Build walls, and tunnels, and then somehow link it to Abu Tor, which will via some magical underground tunnel link to Ramallah? (Hell, they can’t even get the light rail moving). Sure, they continue to physically reside in their own ethnic enclaves, but that doesn’t meant their lives haven’t been integrated into one united and undivided Jerusalem. Olmert will give something major away at Annapolis, but it won’t be Jerusalem. Instead he’ll come back, declaring himself the hero for saving Jerusalem from American pressure, while having seriously damaged us somewhere else. And with a nod and a wink, his coalition of the power-hungry of Shas, Lieberman and the rest of his cronies will remain intact, they after all did their job protecting Jerusalem (sic). Olmert has already frozen construction in Judea and Samaria. Personal security for the average Israeli has once again dropped. What Sacrifice for Peace Power has Olmert in store for us? Starting yesterday, the "One Jerusalem" organization initiated a new campaign, hoping to match or trump the "orange ribbon" campaign that supported Gush Katif before the Disengagement. 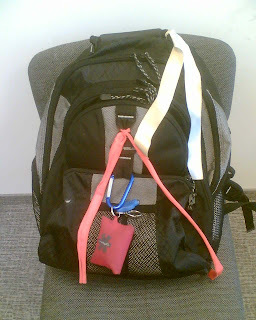 On the eve of the Annapolis Conference where Israel's government is willing to unilaterally concede to terror by abandoning it's control over the West Bank and parts of Jerusalem, the "One Jerusalem" campaign is distributing at street corners throughout the city golden ribbons to be flown from cars, backpacks, and clothing. The orange streamer hanging from our cars' rear view mirror is now joined by a gold one...as on my laptop backpack and all my kids school knapsacks. Those giving out the streamers were the same teenagers that distributed the orange ones. Since most high schools are still on strike, the teenagers have plenty of free time, which is why they're distributing these streamers now. I wonder if when Ehud Olmert gets word that these "Unity for Jerusalem" streamers are being given out everywhere by students -- whether he will quickly order the Treasury to end the strike. Education's never been high on his priority list before...but now he has the perfect excuse to end the strike and prevent more people from having a "politically annoying" gold streamer on their car. Some of the guest contributors at the right hand side of my blog often comment to me privately that my more interesting posts are those still "in draft mode" -- the ones I jot down, but never publish. It's not due to procrastination or laziness, but the post doesn't just "click". Though I don't know if the following is one of those "best" posts, it comes as a response to the following YNET op/ed piece by a Chareidi Yeshiva student. Last week, IDF Human Resources Directorate head Major General Elazar Stern joined those who have lashed out against the widespread "draft dodging" among the ultra-Orthodox. Even though there is nothing new in the arguments, this time around, something did attract my attention, and I quote the Maj.-Gen. Stern: "The existence of the Haredi Nahal regiment refutes the claim that ultra-Orthodox life and the army cannot be combined. They have conditions there that are even better than Bnei Brak," Stern said, referring to a heavily Haredi town in central Israel, "they see no women, not even at a kilometer's distance. Now society must play its role and encourage (Haredi youths) to serve in the army." I was almost convinced. But, there are problems with the magic solution Stern outlined: To the best of my knowledge, the Haredi Nahal was established as a rehabilitative setting for Haredi dropouts. And… success rates are not something to brag about. Stern should talk to the commanders about their painful failure before trying to convince more ultra-Orthodox to join in. For us, enlisting means losing our moral code and values for which we are ready to die. Stern and his likes, on the other hand, transform their values according to the latest trend. With the tiny Yarmulke on his head, Stern lectures us on what's right and wrong. There are too many parents in the ultra-Orthodox sector who sit Shiva for sons who died a spiritual death while serving in the army. When the IDF decides to follow the Torah's laws, my friends and I will gladly fulfill our duty – i.e. Bar Kokhba's army – until then, I'd rather die in the tents of Torah! 1. I have many issues with the IDF following their politicization during the Disengagement, and I am far from a ultra-idealist gung-ho believer in the IDF today. That said, I still volunteer. 3. No one dies in the tents of the Torah unless a bookcase falls on someone's head. That's probably the most offensive aspect of the editorial -- does the author honestly think he is promoting a Chareidi viewpoint by saying such things in YNET? Warning: The posting is not directed against Gedolim or Chareidi Judaism. On the contrary, we love Gedolim and Chareidim...and admire their acts of chessed for the benefit of Klal Yisrael in Israel. This posting however addresses a sinister, much darker shade of black. If you're a Chareidi politician, this is a doomsday scenario. Without forced reliance on government stipends and Chareidi politicial parties in Israel for their existance, Chareidim could "move up in the world" (if they so desired), and even vote for other parties. 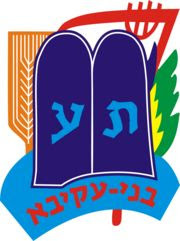 Worse, the big fear is that many Chareidim in yeshiva today who ostensibly are learning in yeshiva because of "Toraso Umnaso" (Torah learning is their profession), and thereby avoiding the culturally unacceptable position of serving in the IDF or helping Israel via "National Service", would no longer stay in yeshiva. They would leave yeshiva to start working and/or study in college. This would prove "The Emporer Has No Clothes" -- the reason so many Chareidim are in Yeshiva is to avoid the culturally unacceptable position of serving in the IDF or helping the "State" and far less to do with "Toraso Umnaso". Don't shoot me -- I'm only the messenger -- Chareidi politicians admit it outright! [Ultra Orthodox Shas Minister of Communications MK Ariel]Attias said to Stern, "your concern is not really for the yeshiva boys. It is for the general workforce. This is really an attempt to allow more people into the workforce and weaken the ranks of those studying Torah [by making it easy for them to leave yeshiva, not just making it easy to stay in yeshiva]. Of course the decision will be made by the gedolei yisrael, however we the representatives will recommend against this precedent to remove yeshiva boys from the world of Torah." Who Rules Israeli Chareidi Judaism? Actually, my original title was Who Ruins Israeli Chareidi Judaism. It's very simple: The Askanim and Chareidi Politicians. Since 10:30 Sunday morning, traffic around Jerusalem has been snarled. The IDF, ShinBet, Police and MDA are all reportedly on the highest alert possible for Israel's capital and surrounding areas. Let's hope they get the terrorist soon. Despite the Shin Bet, Mossad, IDF military intelligence (and the Muqata blog's) strident warning, Olmert has decided to allow the transfer of 25 armored vehicles, 2 million bullets, and 450 terrorist prisoners to Fatah before the upcoming summit in Annapolis. Prime Minister Ehud Olmert has approved the supply of 25 armored vehicles to the Palestinian security organizations in the West Bank, as a "goodwill" gesture to Palestinian President Mahmoud Abbas ahead of the Annapolis peace conference. Olmert's office denied that had authorized the transfer of rifles. The Prime Minister's Office denied previous reports that Israel would supply 50 armored vehicles and 1,000 rifles to the Palestinians: "Not one rifle was approved." Russia offered to transfer the armored vehicles to the Palestinian Authority two years ago, but the IDF and the Shin Bet opposed the proposal for fear that the equipment would reach terror organizations. The objection grew stronger after Hamas took over the Gaza Strip. According to diplomatic sources in Jerusalem, the prime minister decided to agree to the offer several days before the US-sponsored summit, and to allow the Palestinian president to receive the armored vehicles, the weapons and the ammunition. 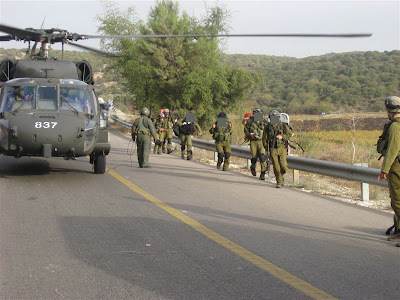 It is unclear when the equipment will be transferred to the PA.
Why worry about reaching Hamas? As everyone already knows, NJOP (National Jewish Outreach Program) is offering a Free Trip for 2 to Israel with their Judaica Across America Contest. To enter, you need to submit a picture of a piece of Judaica you own along with a related story. The winner gets the tickets. NJOP has begun to showcase some of the entries online. My family likes to joke about it sometimes - they say "don't forget to polish the holy grail" or "make sure to put the chalice in the dishwasher," and they 're not wrong; our Kiddush cup looks like it was swiped from King Arthur's court and mistakenly placed on our Shabbat table. It isn't until you closely examine it that you see inscribed between the flowers & flourishes, the words “zechor et yom ha shabbat li kadsho” remember Shabbos & keep it holy. 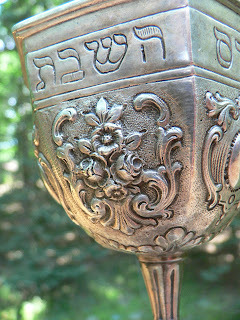 Our kiddush cup has borne witness to almost 80 years of shabbosess remembered and kept holy, beginning in 1928 when my great grandfather received the cup as a wedding gift from his parents. It has presided over Friday night dinners in Germany, Saturday lunches in Poland and many yuntifs in New York, moving with my family as they traveled across the globe, running from Hitler’s Nazi regime. The cup embodies the strength and perseverance of my great grandfather and is a testament to his commitment to Jewish life. After my great grandfather’s death, the Kiddush cup and its history were passed on to my father, who in turn relayed its story to my sister and me. And one shabbos afternoon, im yirtzah hashem, my sister and I will gather our children round and tell them about the adventures of the Holy Grail. So "Dust off your Heritage", enter the contest, and maybe you will win a free trip for 2 to Israel. "And you shall not sacrifice your children to Molech". There are many who say that living in the settlements in a ridiculous thing to do, a needless endangerment of people's lives. I have heard leftists say "why sacrifice your children to Molech, why worship the land?" And yet, I think back to when I moved to the settlements. There didn't used to be terror on the roads like this. This official security establishment estimate in 1993 was that there were a grand total of 15 weapons in the West Bank on the eve of the Olso accords. And yet, even when we say it's a terrible idea, PM Olmert continues to free terrorists...even Fatah terrorists...who then continue to shoot at us. Ehud Olmert and Condoleeza Rice have the blood of Zoldan on her hands. The US is forcing Israel to release even more Fatah terrorists (450) before the upcoming Annapolis Peace convention. Fatah, not Hamas, as a goodwill gesture to PA PM Muhamed Abbas. We said this would happen. We do the best we can to protect ourselves, but when Rice and Olmert are willing to sacrifice our lives for the Molech Annapolis Convention, they must be told that their actions are immoral. Don't sacrifice our lives, do not demand that Israel release more terrorists. Sunday in Sederot...rockts, Monday, rockets. Tuesday...Wednesday...even on Shabbat the poor Sederotians don't get a break. This past Shabbat morning in Sederot...the rockets continued to fall and landed on 3 cars. 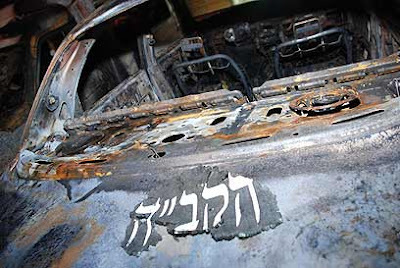 The only thing that remained from the above car were the initials for G-d; HaKadosh Baruch Hu (The Holy One Blessed be He). Friday night wasn't quiet in Kiryat Gat either. In the Chareidi neighborhood of Kiryat Gat, a family caught a robber red-handed. After beating him up significantly that he couldn't run away anymore, he was dragged to a public telephone and forced to call the police to turn himself in. The family didn't want to call themselves because it was Shabbat, so they forced the thief to call and turn himself in. From a Jewish Legal standpoint of halacha, I have no clue if they asked in advance if that was the correct thing to do. Seems to me that even a Jewish thief shouldn't be forced to call the police on Shabbat. kidnap and ship me off to Annapolis. I'm having serious blogger technical issues. (Ezzie: I tried Firefox and Opera and they aren't the solution). However, I have a temporary fix in-hand, and will try to post a few of the missing posts from the past few days over the next few hours. 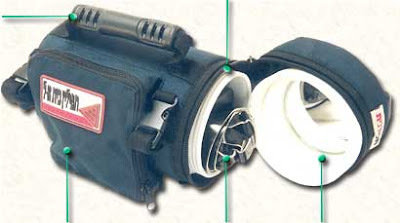 The ultimate ubiquitous bar mitzva gift in Israel is the Tefidanit, the waterproof, shock proof, tefillin case for the typical rambunctious teenager. So when my sons got them as presents, I immediately made them write their name, address and phone numbers on a card and place it in the clear-plastic window of the Tefidanit in case they would G-d forbid lose their tefillin. I had an extremely busy week, and it seemed that every night something else was going on -- school meetings, security, grocery shopping, MDA. I've been trying to get home early at least one night a week, and Thursdays seem like my only option -- I was in a meeting with my manager late this afternoon when my cellphone rang. I told my manager to hang on a second, answered the phone, and asked my son if it was urgent. His tears came through the phone, "Yes, Abba, it's urgent"
Apologizing to my manager, I walked back to my office and asked what was wrong. "I left my tefillin at the bus stop. We finished school early because of the strike, took an early bus home, and I forgot my tefillin there." "Do you remember where exactly? ",I asked. "Yes, and someone already found them. He called me a few minutes ago to tell me he had them. Could you please pick them up in Kfar Sava? I'm really really sorry..." he remorsefully trailed off. So I drove to Kfar Sava to meet the tzaddik who had found my son's tefillin and called my son. I drove to his apartment building, called him up, and he said he'd be right down. The lobby's light turned on a minute later, my son's tefillin in hand -- the tzaddik opened the door looking for me. Two things struck me immediately about this stranger-tzaddik; his bashful smile and the large silver nose-ring coming out of his left nostril. I thanked him profusely, as he explained how he recognized it right away as a tefillin case -- and knew that someone would be very upset about missing it. He said my son was shocked when he called, not even knowing he had forgotten his tefillin at the bus stop, and a complete stranger was calling him up that he shouldn't worry. This bare-headed, nose-ringed tzaddik who called and enthusiastically returned my son's tefillin, who fully observed the mitzva of returning lost objects, hashavat aveida -- li'mehadrin, helped restore a bit more of my faith in klal yisrael, even when sometimes the most tzanua act like menuvalim. Long time readers remember when the Joe-Jameel Book Club used to write these amazing reviews and criticisms of Jewish books that were relevant to the topic of the day. 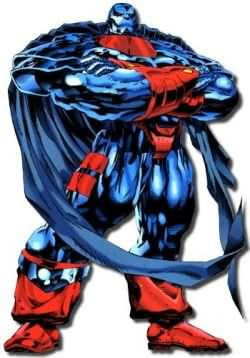 Unfortunately, that blog and its posts were lost in the crossover to New Blogger. Anyway, the Joe-Jameel Book Club was asked to write a review of a book that is now being advertised on this blog. For the sake of disclosure, I haven’t read the entire book yet, just different excerpts from it, but I believe I get the gist. 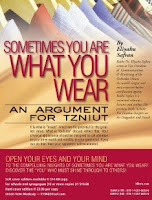 The book is called, “Sometimes you ARE what you wear!” by a Rabbi Eliyahu Safran who also works in the OU. The catch line of the book is “an argument for Tzniut (modesty)”. My wife tells me that in the Beis Yaakovs (plural, she was thrown out of a few of them, but not for Tznius issues) where she went to school they used to constantly give them speeches about the lengths of their skirts, covering their elbows, their hair styles and the like. But Rabbi Safran’s book is clearly not about the length of your sleeves or the color of your shirt. His book is about the internal aspects of Tzniut which Rabbi Safran describes as dignity, nobility, self-worth, self-respect, and self-image, and also how that translates into moral actions. Rabbi Safran maintains that Tzniut is an internal state that is outwardly revealed by one’s choice in clothing. Conversely, he holds that there is also an inverse and symbiotic relationship between one’s clothing and one’s sense of self. The clothing also makes the man, or as scientific studies have shown, while one may smile as a sign of internal happiness, people that smile tend to end up feeling internally happy. Tznius he argues is about bringing your body and soul into alignment and it isn’t just for women. This isn’t a book about permissible fashion statements. This is a book about internalizing and projecting a positive self-image from a Jewish perspective. It’s an interesting idea. Read the book. The views of this post don't necessarily represent those of the Muqata blog (though they really do) and its readers. There is probably no more dangerous animal in the world than the Leftwing Hawk. Yesterday I was invited to partake in a seminar of strategic and security experts who were discussing the current situation vis-à-vis Iran, and Hamas. It was meant to be a purely security-based discussion, with no politics. But based on the backgrounds of the different speakers, one could guess what their positions would be in advance. I found the position of the Liberal Hawk to be quite scary. He provided a unique and logically built historical viewpoint for the development of the current situation, while completely ignoring inconvenient facts that would knock down his tower of cards. I (and others) raised some very serious questions about things he said, which he sidestepped rather than answer directly. His thesis is that there are two parallel and competing ideologies running through Arab society: Nationalism (Nasserism) and Islamic Fundamentalism. Fatah (and its sub-groups) represents Nationalism, and Islamic Jihad and Hamas represents Islamic Fundamentalism. The above is completely true, but not the complete story. The premise for his discussion is that Islamic Fundamentalism is the more dangerous of the two and that peace can be made with Nationalists, and most acts of terror are actually caused by Islamic Fundamentalists. The direct implications of his statements was that one group is religious, which he clearly sees as unthinking and dangerous, while the other group is “secular”, and can therefore be reasoned with. Yet, when I asked him about the fact that both streams create terrorists, his roundabout answer was that the terrorists themselves were bad (implying not necessarily the organizations they came from). (translation: “He is a Fatah Apologist”). He completely ignores that members of Fatah and Hamas armies have gone back and forth depending on who pays them. He completely ignores that Arab Nationalism is also Islamic based (how many Arab Christian Nationalistic terrorist groups are you aware of in the Middle East?). He completely ignores that while Hamas and Fatah may compete for control, it was specifically Arafat and Fatah who enabled Hamas to commit acts of terror against Israel. Which is funny if you think about it. Arafat and the PLO essentially (an openly) strengthened and enabled Hamas to act as their proxy when it was inconvenient for them to act directly, to the point where Hamas gained enough strength to eventually take over. Furthermore, I decided to look up basic facts. 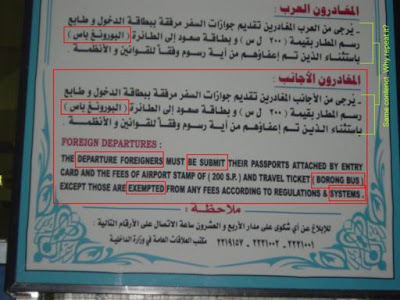 Is Fatah more moderate? Are they capable of making peace, as he firmly believes (given the right circumstances – meaning they have the guns, money, and power). I decided that the best proof or disproof of that would be decided by whether or not Fatah committed acts of terror when they had power and were in control. I found a number of charts. During the same period of time since Arafat was let into Israel, Hamas killed 482 Jews in 73 major massacres, 162 Jews were killed by Islamic Jihad in 32 major massacres, while a mere 129 Jews were killed by Fatah in 23 massacres. In numerous cases the different groups joined together for (i.e. Fatah and Hamas, or Fatah and Islamic Jihad) to commit their acts of terror. In addition, Fatah were involved in some 1500 other terrorist attacks not deemed as major massacres. So what this information does indicate is that Fatah, showed less success that the other groups in committing major terror attacks, they are clearly a full partner and player in the terror infrastructure – even when they are in full power. Yet, here is this security expert, putting his eggs is Fatah’s corner, as “moderates”. Yet the numbers don’t indicate moderation to me, just less success on the mega scale. Another person at the meeting asked another important question. This expert had said, that based on the Palestinian internal divisions between Nationalist and Fundamentalist ideologies, Oslo didn’t have a chance because the Fundamentalist division was ignored - but he supported it anyway. He was then asked, if he knew in advance that it was doomed to fail and that terrorism would definitely result, as he claims he wrote back then, then why in the world did he support Oslo. Now forget for the moment that he thinks we can make peace with Arab Nationalists that want an Arab-only Middle East. Forget for the moment that he ignores the core connection between Islam and Arab nationalism. ..and he continues to support it - because of “Peace”. For the best weather service reports in Israel, see the IMS website. The Yoreh is the first serious rainfall of the Fall/Winter season. A drizzle doesn't count as a Yoreh, and neither does a regular gentle rainfall. The Yoreh is the first serious downpour, which would soak you to the bone if you were outside. the roads would be slick and one should drive with extra caution. Since it doesn't rain over the summer -- motor oil soaks into the road asphalt, and the Yoreh rains bring all the oil to the surface, making them dangerously slippery. Yesterday there were some horrendous accidents on the roads. 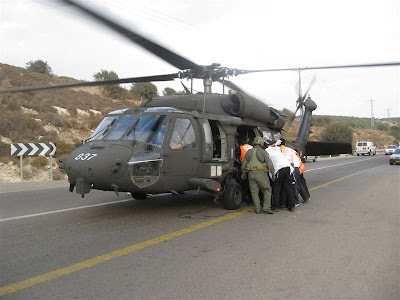 Rarely does one see a IAF helicopter land in the middle of a road to transport accident victims, but it happened twice yesterday. Once near Beit Shemesh at Tzomet HaElah, and once on the Maaleh Adumin road going down to the Dead Sea. Please drive carefully -- especially this week when the roads are especially dangerous! Pictures (and more of them) over here. Forget Dr. Pepper. Throw away your Snapple. Tab? Nee-Hi? Triple-Crown kiddush cola? SEATTLE — It's rare to find kosher ham. Rarer still to find it carbonated and bottled. Just what the Von Treppenwitz sufganiyot aficionado household needs before Chanuka. This guy is such a moron. Only in a country with no political accountability could a politician say, "I hold my head high, and say I goofed." How about saying it with an ounce of modesty? People's homes and lives were destroyed by the Disengagement. The residents of Sederot are in a living hell. And Ben Eliezer holds his head high? He should hang it in shame. The disengagement from Gaza "was a mistake" National Infrastructure Minister Binyamin Ben Eliezer told Non-Stop Radio (Radio Lelo Hafsaka) on Thursday. "I admit and confess," Ben Eliezer said, "I was with those who strongly supported [former prime minister] Ariel Sharon, and today I say with my head held high: We erred, we made a very big mistake." According to Ben Eliezer, a move such as the Gaza pullout can only be successful when the territory one leaves is "handed over to responsible hands and anchored in agreements and international guarantees. Here we have a precedent - a territory we left turns into a base for terror - period." Regarding the ongoing Kassam rocket fire at Israel from the Gaza Strip, Ben Eliezer said there is no escaping the need to act and to respond to the barrages. When asked about potential harm to the Palestinian population in Gaza that would likely result from an Israeli military response, the Infrastructure Minister said attempts to prevent harm to civilians are futile in light of the current situation. "Israel must respond, what else?" Ben Eliezer continued: "Israel continues to say 'I bind myself to ethical obligations,' that no other country in the world binds itself to. "There is a contradiction here between two disciplines," he said. "One nation is prepared to commit suicide and sees it as a mitzvah and an honor, and another wants to spare every ounce of blood." Ben Eliezer's comments came Thursday morning as three Kassam rockets landed in Israeli territory. Two of the rockets landed in open fields near the southern Israeli city of Ashkelon - one near a strategic installation. No one was wounded and there was no damage to property JPOST. Iranian President Mahmoud Ahmadinejad said on Wednesday that his country's nuclear program was irreversible, showing continued defiance in the face of possible new U.N. sanctions. He claimed that Iran now had 3,000 centrifuges to enrich uranium in its Natanz nuclear plant. Enriched uranium can fuel power plants but also, if refined further, act as material for bombs. Booing during a moment of silence is distasteful. Then again, booing during a football match, which is far from a bastion of culture is to be expected. 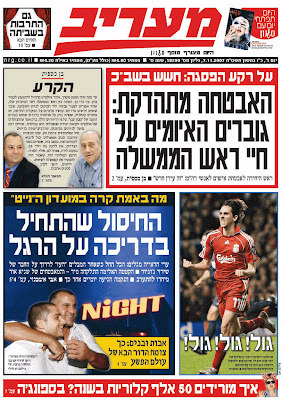 Israel's in a tizzy that Beitar fans booed during the moment of silence for Rabin; reactions range from "imprison anyone who booed for 5 years" under the law against incitement (courtesy of Israel Radio's Moshe Negbi) to suspending the Beitar team based on the booing of their fans. The Hevron** performance is about to start at the Habima Theater in Tel-Aviv. "Would everyone please rise -- we would like to have a moment of silence in the memory of an Israeli politician, murdered because of his political views -- by an extremist. Please join us as we honor the memory of Member of Knesset, Rabbi Meir Kahana, may G-d avenge his death." Best of the top 2501-3500 Blogs: Vote for the Jack (Random Thoughts), Director of Muqata Waffle Development. **Before facing the wrath of good friend David Von Treppenwitz, who is also running and very deserving of the Best Middle East or Africa Blog award, allow me to state why the Muqata is endorsing Mom in Israel. in the TTLB Ecosystem. Shouldn't we root for the underdog, er, underfrog? Besides - Mom in Israel does have a great blog, and I doubt that me endorsing her will come at the expense of my friendship with Trep. Or so I hope. He's the only other blogger I know with equal firepower in his home...to mine. TIGHTENING SECURITY: INCREASED THREATS AGAINST THE PRIME MINISTER'S LIFE. This is classic Israeli spin. PM Olmert's popularity is rather low, the Annapolis summit looks like a dud, the Palestinians are refusing to even acknowledge the right to exist of a Jewish State, so what's a Prime Minister to do? No, the knife fight isn't between the right wing and Ehud Olmert. 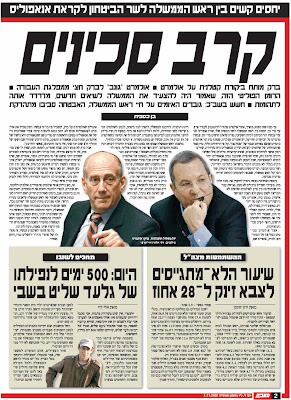 Rather this potentially bloody battle is between Olmert and Defense Minister Barak. Perhaps someone should tell the Shabak where to look if they want to protect Olmert.